This is a guest post from Eric Rosenberg, a finance writer at Personal Profitability, InvestmentZen, and other personal finance, technology, and travel publications. I’ll never forget the day I walked into work and my boss told me it was my last day. I was in shock, not having seen this on the horizon. But it turned out to be a blessing in disguise. Thanks to my side hustle, when I got home from my last day at that company I wasn’t worried about my income falling to zero. I had a backup plan, and it was time to kick into action. 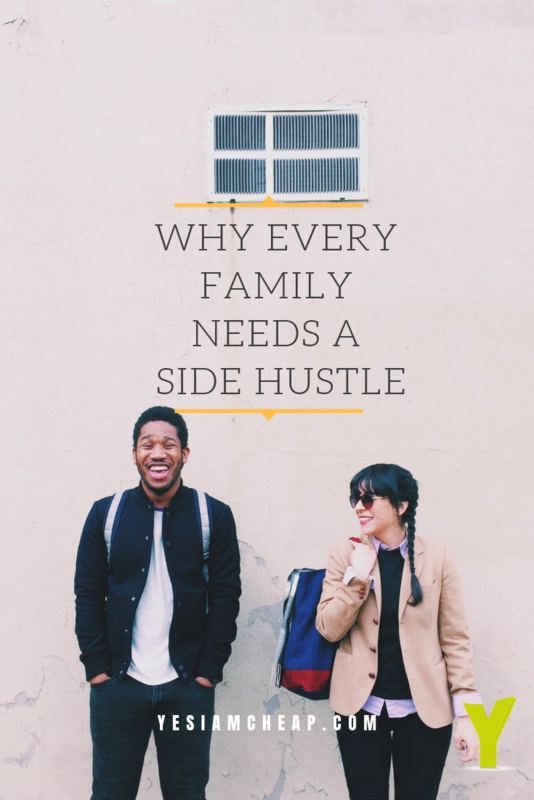 Read on to learn how side hustles fit into my family and how they have completely changed my life. When I started my first side hustle, I had never heard the term before and it was far from mainstream. I didn’t even have a plan to build a big business around it, I just figured I would make a few dollars here and there to help pay for my bar tabs and other weekend entertainment, plus help me put a small dent in my student loans. I had no idea what was to come. I founded my first blog in the summer of 2006, and after a couple of failures established what became Personal Profitability, my primary online hub today. While I started Personal Profitability with the intention of making a few dollars, I had no idea it was also a resume for a new career path. Over the next few years, I grew my blog through writing and networking, attended the first FinCon where I became fast friends with Sandy and other bloggers. That community helped me realize that my blog wasn’t just a website, it was a business. By treating my blog like a business, I was able to grow both traffic and income from the site. But the big surprise came from the businesses who started to ask me to write for their websites. I wasn’t a journalist, but with two finance degrees and years of experience blogging on personal finance, I found myself to be a highly qualified finance writer, and more importantly so did my new clients. I began adding more and more freelance clients and my rates started to climb. I earned $10 for my first paid article, and by the time I was blindsided with a job loss, I had increased my average rate by 10x compared to that first article while simultaneously bringing on new clients. That fateful Friday morning, I didn’t see it coming. But before I even left the room, I knew this might be my “Pat Flynn moment” of turning a job loss into an amazing opportunity. It turned out my unemployment was very short-lived, with a recruiter messaging me literally the same day offering what turned into a job that was closer to home, paid more, had better hours, and a much better boss. But the spark of turning my side hustle into a full-time income was already lighting a fire in my mind. In the month between jobs, I nearly doubled my online income and it didn’t fall after I started the next job. I kept on hustling for my clients on the side and watched my income slowly tick upward. I worked hard at my day job, but evenings and weekends were for the growing hustle that was about to completely revolutionize my life for good. My wife and I welcomed our first child on Halloween in 2015, and at the end of the year I tallied up my side hustle income and was thrilled by the result. I had brought in $40,000 on top of my regular day job. I lived in Portland at this point, and $40,000 put me in line with the median income in the city. Without realizing it, I created a second full-time income for myself while working part-time. After a long day at the office when I left for work before my daughter woke up and got home after she was asleep for the night, I knew it was time for a change. I had to do something different, and now I had a realistic option. However, it was not an easy decision to walk away from my good salary as a Senior Financial Analyst at a great company I enjoyed working for. But this was a defining moment in my life and I took the biggest risk of my adult life. I called up my boss, who worked three time zones away, and told him that I planned to leave the company. As you can see from the chart above, the decision worked out well. When I took my side hustle full-time, I also dramatically increased the number of hours I spent finding clients and writing for them. I had 9 full-time months in 2016 and was able to more than double my income from the year before. Of course, it wasn’t all unicorns and rainbows. I now had to pay for health insurance myself rather than get a big portion paid by my employer. I now had to deal with more complex business tax returns. But it also put my family’s financial security in my hands. It also gave me an amazing lifestyle where I set my own hours, vacation schedule, and can work from anywhere in the world. I also work from home full-time, so I never go a day without seeing my little girl. ← Do Credit Companies Have a Responsibility to Tell People the Facts about Debt? Very good inspirational post. Sometimes we all need that “reality” to make our side hustle really take off. It was good that you had years of experience under your belt so that when the time came you were ready to hit the ground running. A great reminder that everyone should really have a plan b, c, and d! Eric – Thanks for sharing your story on here. Getting that $40K in side income must of felt great – great enough for you to go out on your own. You had a plan and followed through. Not everyone that goes out on their own will be a success so it’s good that people test the waters and become a bit successful before bailing on their main gig. this article really hits the spot. families these days dont really have that stability or a single income just dont cut it anymore. i too, began my side hustle earlier this month. One thing to add, start from what you know, see how your current skills and knowledge can be incorporated into other jobs. make sure it brings value to the business you are branching of to. My background is design/post production(tv commercials, ad design), after 10 years of work, i felt like i was comfortable enough to branch out to other careers that can help me climb even further in life. so i looked into marketing, i studied/took classes, began pitching my marketing ideas to companies. i landed a part time gig as a marketing manager. Although working two gigs can be hard, its always nice to know your skills aren’t just catered to your current job. Good on you for exploiting your talents!